and I've found some adorable things for your pleasure. Tina had this cute cute sign painted on the driveway side of her cottage. 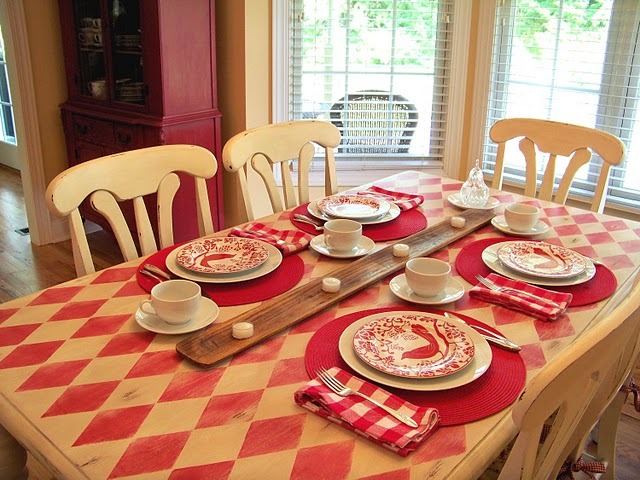 PENNY stenciled her table, taking inspiration from a beautiful quilt. You did a magnificent job, Penny. You will love this pretty table forever and ever.....amen. just jump off the page. And the wall takes on such dimension when using the darker, iron brackets. I'm looking for just ONE tiny wall that doesn't already have something on it so I can do this very thing. I sure would like to have that much classic WHITE IRONSTONE. dishes that we all seem to love so much? but, mercy, we all sure do love 'em. Same with colorless ironstone, I think. and sure knows what to do with them. just PERFECT for this country sun room. Wicker and beautiful, soft pillows just make ya want to stay here forever. and added a couple of cookbooks. How does she make her books stand up straight in the holder? SHE MADE PRINTABLES for US. just cuteness all over the place. She is one of the Queens of PAINT ...everything she touches turns out beautifully. decorations out the whole month of JULY. 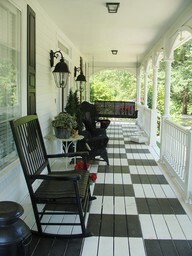 I would have me some PORCH LOVE, just like this ! instead of large and wraparound. instead of the wonderful wooden porch flooring as in the photo. What was the contractor THINKING !! ...and, to me, there's not much prettier in this world than white painted wood floors. If you LUV lemon, go HERE for this wonderful treat. button for your sidebar if you have been showcased. 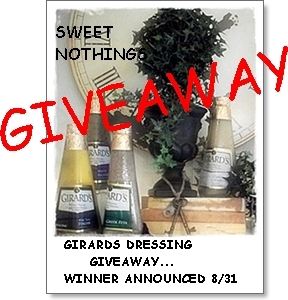 Be sure to click HERE for a chance to win a delicious giveaway. Those lemon bars look wonderful. I am drooling over here. I need you to send me your info so I can pass it on for your prize! Great selections, BJ! You sure get around, girl! Wish I could send you some of the bath water Irene is going to spill on us. We don't need it, and TX does. Always the way! THANK YOU!! For featuring my table BJ!!! You are soo sweet. Love all of the other features too. Seriously! 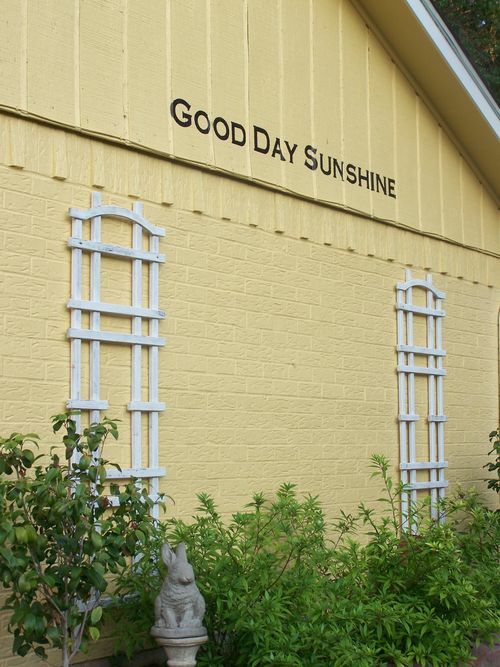 I am going to find a picture where I painted a cement porch and do a blog about it just for you! BJ, I am honored to be among all these wonderful features. What fun. This was like a specialty catalog of wonderful places. I know where I'll be visiting this weekend. Have a safe one sweetie. Oh BJ! Thank you for posting me with all those talented bloggers. I had to giggle about wishing you could open your eyes to find your dining room like the picture....I could do that every day myself. Have a great weekend dear one....you knock our sox off every week! Thanks for posting all these lovely photos and sharing their beauty with us. I feel like I've been to a Home Show. Your Blog is BEAUTIFUL!! I love it!! Love all of your features. But oh my love that last pic with the watering cans. Wish mine looked like that too. Only in my dreams. Wow so many great photos! I love the porch! I just love Penny's table! Wow, bj!! Those were wonderful! Wish I had a wall too...I mean that isn't already crowded...such wonderful ideas! 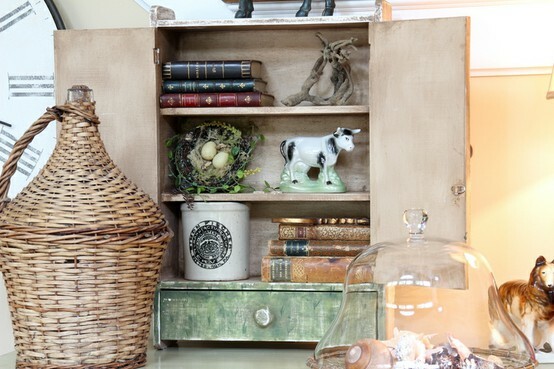 That porch and Penny's table were fantastic! Why can't I ever think of things like that!! :) Thanks for sharing those. Thanks for bringing some beauty into my world this morning as Irene rock and rolls all over the place outside. I've been up since 4:00 am just listening to the howling and things that go bump in the night! We are safe and I'm thankful for that. But Irene isn't done yet! Love all your beautiful inspiration photos. Really enjoyed all your photos; so much fun to come here with my cup of tea; never know what surprise is waiting for me; thankyou. BJ, You could produce your own magazine with pictures like these! I liked them all and especially found the question of why we like white dishes so much intriguing. The lemon bars looked pretty delicious too! Well, my socks are OFF!! All lovely photos BJ. 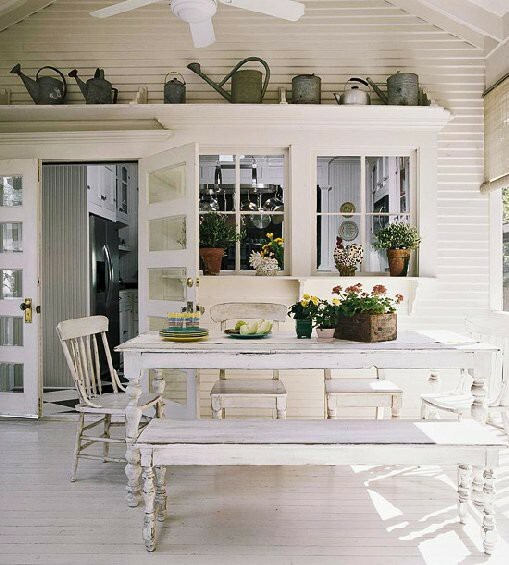 I am loving the painted porch and that vintage wicker furniture (although I am sure I would be painting it black) and how I agree -- just what is it about white ironstone dishes that makes us all swoon!! Lovely summer time joy in these August Knock My Sox Off post photos. Your photos knocked my socks off too - I especially like the Pottery Barn photos! Yep, my socks came off and are now in the laundry hamper. :)Love all the pics, but my favorite is the table. Oh la la could I live with that! Love all the pics and makes me want do that sunroom in mine. Lady your killing me with all that good food you cook. How do you stay so slim and beautiful. Thanks for sharing. Great looking at those pictures isn't it? Pretty post..have a great weekend. So-o-o-o many gorgeous things to look at, but gotta LOVE those lemon bars!!! YUM! I found you and am following. Loving it over here. Ok, you knocked my socks off. BIG smile. This is a very cute idea. sometimes I see a post that is so awesome it does knock my socks off. Leave it to you my clever friend to make a post out of all theses awesome photos. Thanks for the shout out dear!! :) Great round up!! hi bj, Great features for KMSO. I love the sign painted on the house, just to cute. Bj, these are wonderful, each one. But just have to say, you knock my socks off all the time! first the pinning a while ago with the lemon cookies, now you torture me with lemon bars?!! Oh be still my heart. Love all your photo shares. That porch looks so inviting. A mint julep and the sounds of the cicadas in the distance with good company to chat with on a long hot summer day....yes indeed!! Another great selection to knock everyone's sox off. Thanks for putting them all together in one place for us to enjoy. Great ideas, thanks for sharing them. I love the shadows the shelf brackets made, that wonderful sun pouring in that beautiful kitchen-so pretty. Great ideas. Love those shelves filled with ironstone. 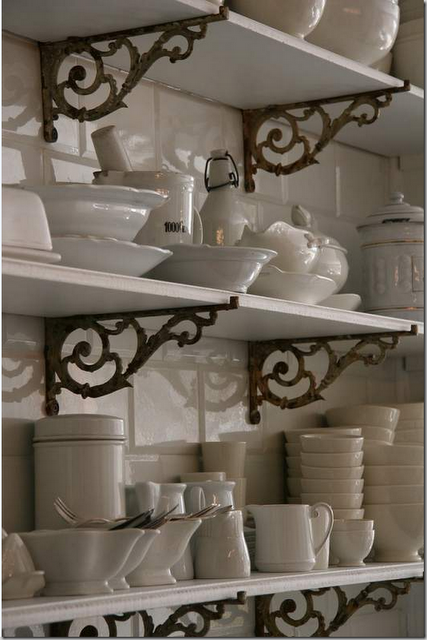 I think the tiles, iron brackets, shelves, and ironstone in the Cote de Texas kitchen is spectacular! These are some great features, BJ. Love them all!!! Happy Pink Saturday, my dear friend. 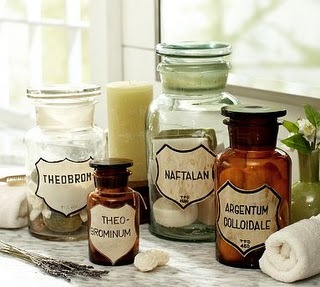 Ooh, you are sharing so many pretties with us today. I love it all. The lemon Bars looks delicious, very inviting. I'm also amused with those pink pillows, very cute.